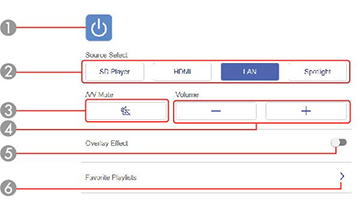 Once you have connected your projector to your network, you can select projector settings and control projection using a compatible web browser. This lets you access the projector remotely. Note: The web setup and control features support Microsoft Internet Explorer 11.0 or later, Microsoft Edge, Google Chrome, and Safari on networks that do not use a proxy server for connection. You cannot select all of the projector menu settings or control all projector functions using a web browser. Note: If you set Standby Mode to Communication On in the Extended menu, you can use a web browser to select settings and control projection even if the projector is in standby mode. Make sure the projector is turned on. Start your web browser on a computer or device connected to the network. Type the projector's IP address into the browser's address box and press the computer's Enter key. 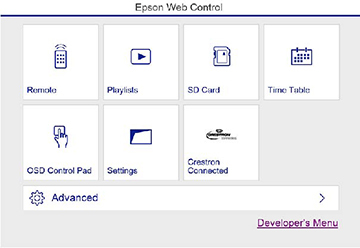 To control projection remotely, select the Remote option from the Epson Web Control screen. Select the icon corresponding to the projector function you want to control. To select projector menu settings, select Advanced on the Epson Web Control screen. Select the name of the menu and follow the on-screen instructions.